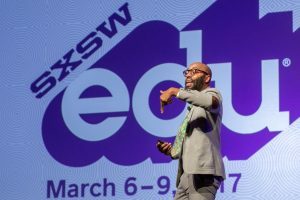 The 2017 SXSWedu conference and festival kicked off here Monday with author Christopher Emdin, who wrote the book, “For White Folks Who Teach in the Hood … and the Rest of Y’all Too,” questioning the motives and intentions of hundreds of attendees. Christopher Emdin opened SXSWedu 2017 by challenging attendees not to “tech away” the problems of disenfranchised students. Were they here as friends, enemies, or “frenemies” of education? Did they understand that education is the civil rights issue of our time, he asked. The distinction matters because it’s the lens through which each person would experience the conference, how they understand the role of technology in urban schools, and how they act in their daily lives, he said. Friends agree with that position and are dedicated to recognizing the academic potential of all students and giving them a voice in their educations. Enemies “are not inherently bad people,” Emdin said, but they are at the seventh annual SXSWedu with the sole intention of pitching their new product and making social connections, and are not interested in going beyond that to help or understand students who are marginalized. Emdin labeled the rest, “frenemies” who might talk the talk, but are primarily focused on their products and the bottom line. Or they are people who “come to this work with amazing intentions—who really believe what the friends believe in—but by virtue of being part of certain structures, they end up becoming enemies,” Emdin said. A student might speak in a “very vernacular form of discourse that is perceived as nonacademic,” leaving a teacher with the impression that this young person doesn’t have the ability to engage academically, he said. Instead, the responsibility falls to the teacher to value that student, his or her culture and interests, and to engage the student academically. The only way the educational community can begin to help urban young people who have been marginalized is by engaging in conversations with them. “Everybody’s making decisions about what they need, without engaging them in conversations about what they want,” he said. As for the impact of technology, Emdin said that “schooling has been framed essentially like a contemporary space program,” with high tech viewed as a moonshot. Many perceive that “the more you can throw technology” at the academic issues students have, the better off they will be, he said. “But when you try to ‘tech away’ the problem, the problem isn’t solved” in a classroom of young people who have been disenfranchised.